After two years, another grizzly has been photographed well south in the lofty Wind River Range, west of Lander, WY. 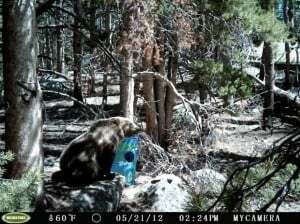 The bear was caught by a trail camera. The bear was in a dense stand of lodgepole pine in the vicinity of Sinks Canyon. The photo was taken in late May, and the results just released by Wyoming Game and Fish. In addition to these two recent grizzlies, back in 2007 a poorly fed griz was mistakenly shot on the other side (west side) of the Range about an equal latitude south. It looks like our large carnivores are recolonizing vacant habitat whether we like it or not! I saw the video a couple days ago and wondered if I should put it up. Thanks, and I hope your are right about the spread of carnivores. Grizzlies used tor ange from the southwest shores of Hudson Bay all the way to the mountains north of Guadalajara Mexico, and all the way to the Pacific Coast where they currently reside only on the California State Flag. Psssst, that´s why the usual suspects are already gnawing on it´s protection! These bears urgently need a little management……..
By a “little management”, you mean a bullet, right? They have already had lots of “little management” from WS, the states, and ranchers. When when we learn that there is room for humans and bears? You don’t need to be so greedy! and I say good riddance….I like black bears, wolves, wolverines, marten, coyotes, mink, fishers, weasels and all other predators/carnivores in Idaho and surrounding areas but I don’t want grizzlies any farther than YNP. I don’t want to have to pack a gun or spray on every hike I take. I don’t want to think about hiking in the Bitterroots with the thought there really is a critter that wouldn’t mind kicking my a##. And if anyone here appreciates the free roaming hiking available in the Bitterroots, they will not want those beasts here either. Plain and simple grizzlies are moody and often don’t mind taking after a human. Dan – guessing you’d rather “see em all in zoos” so you can freely roam about in what use to be their habitat?? Chipmunks, squirrels, an occasional fox, is that what you’d prefer to see while “free roaming” wilderness areas? Timber tigers are always a joy to see, as well as, deer, elk, black bears, any bird and any one of the numerous other critters in the Bitterroots…. So they’re fine as long as they are not in your back yard… NIMBY? Dan-don’t you think your fear of grizzlies is a little over the top? Cougars, moose, lightning, rock fall, and the drive to the nearest trailhead are all more probably more realistic risks in the backcountry. When I moved to the GYE 15 years ago I was nervous, especially after reading Death in Yellowstone and Grizzly Tales, but after 15 years of hiking, hunting and boating in grizzly habitat I think the reality is you’ll probably never see a bear period, let alone a grizzly and if you do the chances that one is going to attack that day is probably pretty slim. Dan I used to feel just like that when I moved from California to Washington . . I just wished there were no bears so I could feel free to hike by myself. I got over it. . . so much so that I ended up being a guide in Alaska taking people out to see brown bears and now I wish there were grizzlies here. Your fears are real but not realistic. I know Ralph didn’t put this blog here for us to sell our books, but in this case you would really benefit from reading “Lonesome for Bears” which starts where you are and ends how I feel about bears now. Ask your library to get it for you. The grizzly bear is one species where it seems that the fewer there are in an area (down something above zero), the more we tend to fear them. As a kid in Yellowstone in the 60s and 70s when there were probably about a third as many as are there now, the idea that they were out there somewhere used to really give my friends and me the hives at times during our backcountry trips. We explored with a gnawing apprehension centered around a fundamental but unspoken equation: grizzly encounter = horrible death. Less so now that they are common enough that you can actually watch them forage from the road. Pepper spray has helped a great deal too, by simply giving people something more convincing to construct a plan around than playing dead (if unable to quickly scramble up a tree). That comment was a bit over the top don’t you think? My wife has many family members that are native Montana and they hike, hunt and fish all over the western part of the state including the few that live in the Bitterroot and all of them tell me the least of their fears concern Grizzly bears! I have lived in NW Montana now for over 15 years and never once have I feared a bear, I do respect them and have had to use bear spray, but I don’t fear them. No, not over the top at all. I do not want their numbers any larger in the Bitterroots than they already are….Lewis And Clark had a heck of a time with them and I would never want them to be at those numbers again and I am not afraid at all to be vocal about it…I live in the big woods and spend a ton of time there and I don’t want the thought of those beasts being numerous where I am…The majority of the people here live in the city or burbs and take a hike or two in the woods so yeah, if I was them I wouldn’t have any concerns either, but their life is not mine…I’ve had black bears within yards of my place on numerous occasions and I would not want to think it could be a grizz instead of a little ole black bear. My neighbor, who I consider a master naturalist, has live woods for the last 40 years and is the ultimate mountain man. (He rode a pedal bike from N. Idaho to Kansas and once hiked 52 miles in the Bitterroots in 2 days) He hikes hundreds of miles a year in the St. Joe and is an avid supporter of wolves and all other critters except the grizz. When it comes to the grizz he’s just like me, don’t want them and don’t need them in the St. Joe. Dan first of all I have read the entire Lewis and Clark journals (not the abridged version) and in every case but two they shot the bears on sight and were dealing with wounded bears. In one case, Lewis had forgotten to load his gun and let what sounds like a teenage bear chase him into a river. He turned on it and it ran away. Secondly it is the rare male black bear who is most dangerous. Herrero announced sometime last year that he and some others researchers found that occasionally a male black bear decides to stalk a human and acts just like a stalker, and that statistically is the most dangerous bear, not the mother bear or the grizzly whose motivations are defensive. Grizzlies usually have a reason for hurting people and that reason is not to eat them. It is easy to avoid doing stupid things around grizzlies once you know what they are. Your stance against grizzlies is just a symptom of know knowing the animal. Alaskans live with bears easily and so can we. Unrealistic and paranoid fears have driven this nation to be gun-crazy and very violent. I fear more from the crazed two-legged critters roaming the woods than I ever do of the four-legged ones. I carry bear spray too, but its not meant for bears. Dan I realize I won’t change your mind on this but for others who are reading this it is PEOPLE who are moody and dangerous.. bears are just trying to get along with no malicious intent and only become dangerous when people screw up. As for Treadwell . . all I can say is he was eaten by a bear and as to whether he was killed by a bear . . well the people who got there first assumed that and the area was not treated as a crime scene because everyone thought they saw the facts clearly. He lived up close and personal with bears for 13 years and as one writer who I will leave unnamed said to me “the facts just aren’t there . . we will probably never know what happened.” Treadwell’s demise is not an excuse for not understanding the animal. If you don’t want to read my book, try Smiling Bears written by a woman who really had to get to know the true nature of bears, or read Casey Anderson’s book. People in Alaska love to walk around with guns and knives and play up the frontier . . Dan I know you are set in your mind about this so I won’t go back and forth now . . actually I am headed out tonight to go track grizzlies in the Northern Cascades. . Have a good weekend and thanks for reading anyway. Dan, there are some beautiful places in this country that are chock-full of black bears, white-tailed deer, bobcats, red foxes, gray foxes, wild turkeys, coyotes, etc., but where grizzly bears do not now nor ever will reside again. Maybe one of them is right for you? Having the big bears around means a lot to most of the rest of us – even those of us that spend a significant amount of time in the “big woods” with all them “critters”. They’re actually pretty easy to live with assuming one is not functioning on autopilot 24/7. Bend a little, show some grace, adapt to your environment, learn to accept that with wild places come actual wild animals, some that are higher on the food chain than you – that’s the real beauty (and some would argue philosophically and biologically, the real need) of our part of the country. OK, let’s take a little vote. Come to my place in the big woods and we’ll poll all the people that come in. (I have a little tourist store at the last stop on the road for 60 miles through and over the Bitterroot divide) I’ll bet it’s 10 to 1 for people who do not want them in the St. Joe. I would be interested in seeing the results of a poll like that, a true poll, not a one sided biased poll, I have been in that store at the end of the road, quick a beautiful area, but I suspect you may be surprised with the result of an honest poll of those tourists. The fly shop and ice cream shop? Hope they continue to migrate south. Would love to see them return to Colorado…not holding my breath but its a dream of mine. Always good to see them expanding their range. I guess I’ll be more careful if I’m up in the Winds. I’m guessing they won’t get much further south unless they find the Red Desert to their liking. Seems that many people have taken Bambi to literally. Seriously guys, all the little forest animals don’t hang out in the flower patch talking with each other all day. Dan is right, grizzlies are moody. They really don’t care how much you love them. It is only a matter of time before someone is killed in the Winds by one. Grizzlies should not be allowed to spread any further. Pretty soon their won’t be anywhere in the Rockies I can take my kids backpacking. So, Jeff, you’re saying that anyone who welcomes grizzlies back into historic range just doesn’t understand that grizzlies are dangerous? That they must be people who think grizzlies will spare them if they’ve kept current with their Ranger Rick subscription? Could be that these people have the same or better factual understanding as you, but just have different ideas about how the world works, what’s important, what risks are worthwhile, and so on. Might oughta consider that instead of making a bunch of condescending remarks. or sit in front of the TV eating garbage food til they can’t think or move. I don’t want to be cavalier about the risks posed by grizzlies (I 30 miles from the YNP boundary; I don’t live in a town; I have grizzlies and wolves around here most of the year), but against the backdrop of a stupifying, toxic culture, I’ll take my chances out here with the bears. Welcome Jeff. You might want to spend some time looking thru “previous entries” and read any comments you run across by Linda Jo Hunter. A fountain of information when it comes to sharing the “woods” with bears.